At the end of last year we reported that Faber Music was delighted to be working in association with Save The Children to promote their Christmas singing campaign. 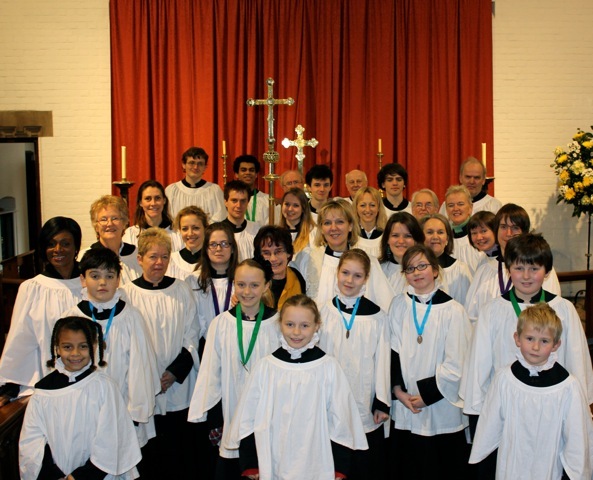 The "Sing for Save The Children" campaign encouraged choirs from all around the country to raise money for the charity over the Christmas period. Dozens of choirs signed up and held collections at their concerts. The names of the choirs which raised the highest sums were then put into a prize draw - and the winner, St. Michael's Church Sutton Court in Chiswick, received £100 of choral sheet music vouchers from Faber Music. "One of the highlights of the year at St Michael’s Church Sutton Court in Chiswick is the annual carol singing round the streets in aid of Save the Children. The choir, which is affiliated to the RSCM and numbers some thirty adults and children, is joined by a team of collectors and we sing a capella in harmony round the streets of Grove Park for a couple of hours one evening in the week before Christmas. We set out regardless of the weather and over the years have braved snow, ice and rain, though last year was ideally crisp and dry! The residents look forward to it and are ready with their money and their requests for favourite carols. Last Christmas we were invited into the local winebar where the clientele was very generous and as usual we stopped off for mulled wine and mince pies at the house of a member of the congregation who often invites friends round for a Christmas drink to hear their favourites. We always end with a party at the house of a choir member, where the junior members retire to count the money, hoping to beat the previous year’s takings. We were delighted to hear that last Christmas we had unexpectedly won Faber Music’s most generous prize of £100 for music and have chosen Six Motets by Mozart which will make a great addition to our anthem repertoire."